At the end of the semester, students think about vacation and professors think about grades. I love every part of the university experience except grading. While the stress of grading has not changed, the average grade has. Grades have experienced inflation, with the average college grade rising steadily over time. There have been lots of suggestions on why grade inflation has occurred. Some people suggest students are better prepared. Others suggest professors’ standards have declined. One reason that I have not seen suggested that might be a possibility is the rising cost of tuition. The figure below shows the total yearly amount paid after financial aid at the average private college for tuition, room and board. The figure is adjusted for inflation and shows that the inflation adjusted price of college does not change much until early 1980s. Then it more than doubles! Why is this figure important? When college was cheap, flunking a student or giving them a low grade was not expensive. Flunking a student today causes them to incur a large cost. A student who gets no financial aid at a private college and flunks out at the end of their freshman year loses over $50,000! The $50,000 is just out of pocket expenses and doesn’t include their opportunity costs. It might be that professors realize that as college gets more expensive, people are expecting some measurable return on their investment and one measurable return is a higher grade. I have been pondering how to test if rising tuition is one of the causes of grade inflation but have not come up with any ideas where data exist to test this idea. If you have any thoughts where the data exist let me know. Today, the Federal Reserve announced it would shift from buying $85 billion dollars of bonds each month to buying $75 billion. The news of the $10 billion drop sent the stock market soaring. This post tries to explain what the bond buying program does. First, you need to understand that bond prices are inversely related to interest rates. What does that mean? When bonds prices go up interest rates go down. When bond prices go down interest rates go up. The detailed reasons for this are explained in chapter 15 of my book “Business Macroeconomics”. Buying either $85 or $75 billion of bonds each month is a lot of purchases. This means the Fed is shifting the demand curve for bonds to the right. At every given price for a bond there are now more people who wish to buy the bond than there would be if the Fed was not involved. 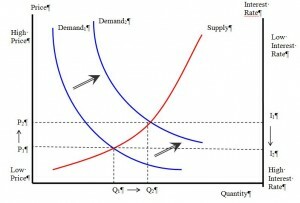 When the Fed shifts the demand curve right, the price rises. Since bond prices are inversely related to interest rates, this means interest rates fall. The situation is graphed below. A reduction from $85 billion to $75 billion means the demand curve each month is not being shifted to the right as much as before. However, given the $10 billion reduction is only about a 12% change, it appears Wall Street traders don’t think the reduction will have any major economic impact. Will the traders be right or wrong? Only time will tell. What Size Champagne Should We Buy For The Holidays? As a special treat for Thanksgiving I purchased a giant Jeroboam bottle of red wine. A Jeroboam is 3 liters, which is four regular sized bottles of wine. The Jeroboam turned peoples heads when I brought it out. I was thinking maybe a giant bottle of Champagne for New Years Eve might be just the thing. 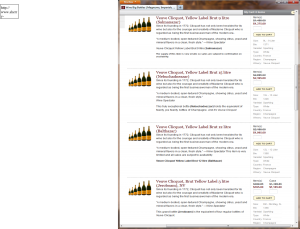 The table shows that the cheapest Champagne on a price per liter basis is the regular “Standard” size bottle. Unlike when buying meat, fruits and vegetables, bigger is NOT better when buying Champagne. As a matter of fact, the bigger the bottle the larger the price premium! 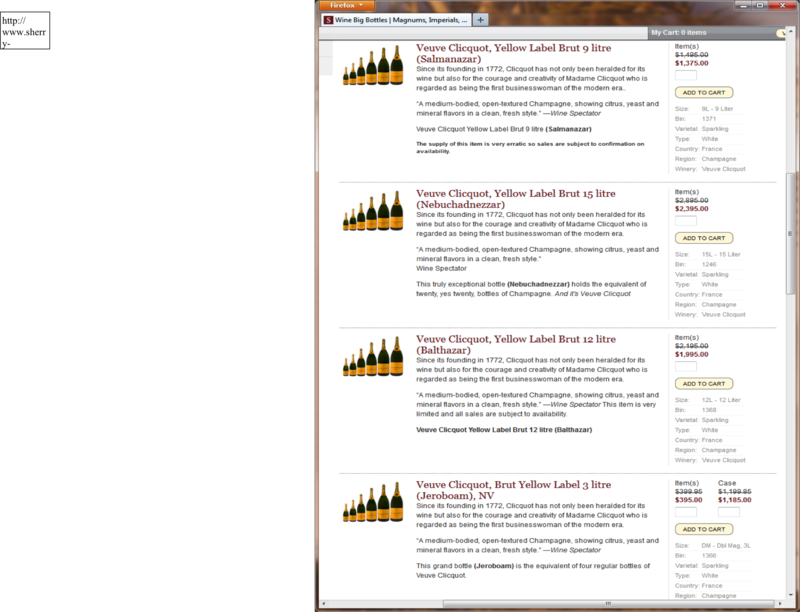 One 15 liter Nebuchadnezzar costs $2,395. Buying 20 bottles of the standard 3/4 liter size, which gives you the same amount of Champagne, costs only $919, a savings of almost $1,500. The lesson of this blog post is simple. During the holidays when shopping for wine don’t buy the big size. Stick with the regular sized bottle and spend the money you save on something else. PS: For those of you who are not convinced by the economics, trying to pour wine out of a Jeroboam into a small wine glass at Thanksgiving proved to be very hard. We ended up pouring most of the red wine into water pitchers so that no one made a huge mess. The Jeroboam makes a great statement when you walk into the room carrying it, but is a real pain in the neck to actually use. On Sunday mornings I often listen to a talk radio show on financial advice called the “Ric Edelman” show. The show is an infomercial for a nationwide chain of financial advisers. A few minutes ago Ric stated that one of the dumbest purchases anyone could make was flying first class. Given I am thinking about flying to Tokyo and Seoul (see the Nov. 15th post) in either coach or business class I was struck by the comment. The difference in price is a lot. The post shows it costs about $3,000 to fly business class while coach was a bit under $2,000. This means business class tickets costs 50% more. If the decision is based solely on speed, Ric is clearly right. The fancy seats in the front of the plane get there at the same time as the cheap seats in the back of the plane. However, time to the destination is not the real factor. Instead for long haul flights it is time to recover. When people get off a very long plane flight it can take a day or two to recover. Being able to get sleep and some leg room is worthwhile because it enables you to regain your productivity quicker. My personal experience (yours might be different) is that it takes about 3/4 of a working hour to recover for every hour sitting in coach on a long haul flight it. This means a 10 hour flight kills off about one work day. The round-trip flight to Tokyo/Seoul is 30 hours in total, which means about 3 work days to recover. So the decision rule is pretty simple. If, [First/Business Class Price – Coach Price] / Recovery Time > What You Lose in Productivity, then you should fly business class as a smart financial decision. In this example the value of flying business class is ($3,000-$2,000) / 3 = $333 per day. People who earn more than $333 per day in this case should fly business/first class and people who earn less should fly coach. This simple formula shows first that Ric’s blanket statement that flying first class is one of the dumbest purchases someone can make is not always true. The second thing the formula shows is why most professors are found in the back of the plane with their students! Nelson Mandela, the former president of South Africa, died yesterday (Dec. 5, 2013) at the age of 95. A few months ago I had the opportunity to visit South Africa. I was amazed by a two things while there. First, some of the museums that we visited tried to present Mandela not just as a saint but as a real person whose story was not as perfect as the eulogies we are hearing today. For example, the Apartheid museum in Johannesburg has interesting video footage of blacks during the 1990s ripping down election posters of Mandela and stomping on his face. While news reports today suggest universal love for the man, the news footage from twenty years ago did not show that same kind of feelings. The second thing that amazed me was that apartheid had its origin in the Great Depression. Many South African whites and blacks lost their jobs during the 1930s. The white response was to ban blacks from jobs and restrict their movements. This resulted in less competition in the labor market for white workers, which boosted their earnings. We think of the Great Depression as primarily lasting just during the 1930s. However, it became clear to me in South Africa that institutions and policies set up to combat this huge economic downturn continued on for many decades. One of my takeaways from the trip was that economic events can continue to impact society long after the actual economic event has receded into a dim memory. Is Cyber Monday Really A Good Deal For Shoppers? Today is Cyber Monday, the day everyone is supposed to go shopping online. I need (or is it want) a new portable computer to replace my old netbook. I was looking to buy the ASUS Transformer Book T100TA-C1-GR, which is half tablet and half laptop. I figured I would get a good price by going to Amazon.com so last night (Sunday) just before midnight I called up the item and saw it was $380 (but currently out of stock). I waited until what I thought was midnight to get the Cyber Monday price, clicked buy and went to bed. This morning I got an email from Amazon telling me that I had purchased the computer for $380. However, the email showed that I bought the computer on Sunday, NOT Cyber Monday. Oh, no!!!! I went back to the Amazon website to see how much money I had lost by clicking too early. The answer is that on Cyber Monday the computer cost $8 MORE. Wow. I saved money by not buying on Cyber Monday. I had read a few articles that suggested that Black Friday and Cyber Monday didn’t have the best deals but I didn’t believe them until I made the mistake of buying too early. Have you encountered this also? 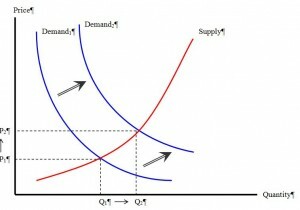 PS: For those of you who are wondering about the economics of the situation, below is a supply and demand graph. 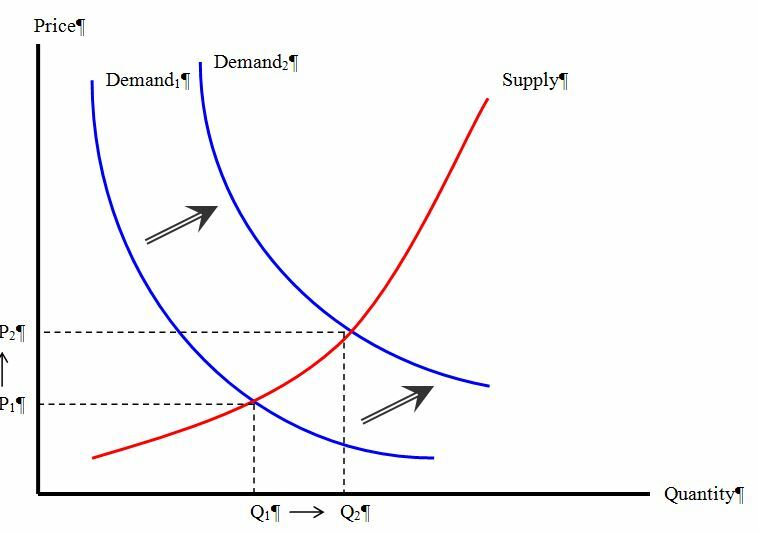 On Cyber Monday we expect the demand curve to shift right because lots of people are trying to buy items online. 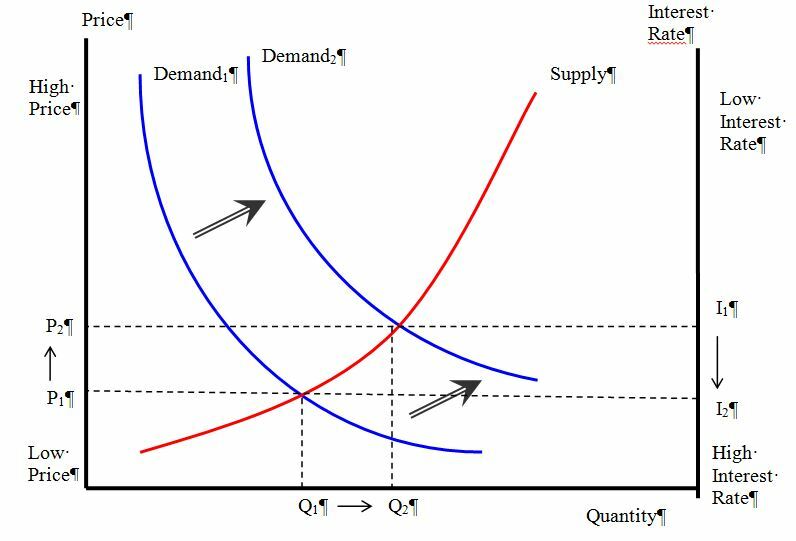 This demand curve shift results in more items purchased (what we see on Cyber Monday) and an increase in price (what I experienced).